Ed O’Bannon was the star of UCLA’s basketball team in the mid-1990s. He led the team to the 1995 NCAA championship and was named the Final Four Most Outstanding Player. Replays of his classic games are often shown on sports networks. Today, O’Bannon sells cars in Las Vegas. When his games air, he earns no royalties. He didn’t even know his likeness was used in a video game until a few years ago, when he was at a friend’s house and saw his friend’s son playing NCAA March Madness with an avatar that looked a lot like him. "Initially I was excited. Who wouldn’t be excited if you saw your face on a video game? I grew up with video games, so I was pretty pumped," O’Bannon says. "But after thinking about it, my feelings changed. … Something is wrong with this picture." 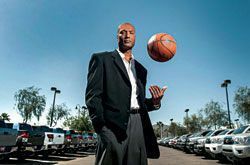 Now O’Bannon is the lead plaintiff in a class action claiming college basketball and football players are illegally denied compensation for the use of their names, images and likenesses in video games, DVDs, reruns of games and other promotional materials. The lawsuit names the National Collegiate Athletic Association; the video game company EA Sports, based in Redwood City, Calif.; and the Collegiate Licensing Co., the Atlanta trademark licensing company, as defendants. The suit, filed in July 2009 in the U.S. District Court for the Northern District of California, alleges antitrust violations based on the requirement that student athletes forgo the right to make a profit from licensing the use of their name, image or likeness. According to the suit, the NCAA imposes the requirement to preserve the amateurism of college sports. But O’Bannon and the other plaintiffs argue that these rules should not apply once players’ college careers have ended, and that the "spirit of amateurism" is no longer at risk. The dispute centers on a waiver, Form 08-3a, that student-athletes sign at the beginning of their college careers. It grants the NCAA, or a third party representing the association, the right to use their names and pictures for promotions. The plaintiffs argue that by signing the waiver, which is required in order to participate in NCAA athletics, the association conspired to deny them the fees from their names, images or likenesses. Without the waiver, the plaintiffs argue, they could have gotten a competitive price for the use of their names, images or likenesses. The suit is seeking a trust that would allow players, upon leaving school, to receive a portion of the money generated by the use of their names, images and likenesses, according to Washington, D.C., attorney Michael Hausfeld, the suit’s lead lawyer. Hausfeld estimates that if the plaintiffs are successful, the NCAA will have to pay "potentially billions of dollars" to the fund. Others estimate the loss at several millions. "It’s an organization that acts as if it controls its own fiefdom," Hausfeld says of the NCAA. "They control their basic lifestyle and obligations when they’re in college and provide them with nothing; [they] shortchange the athletes in terms of the quality and type of education they deliver; and clearly now, as well, acknowledge that they shortchange the amount of income necessary for the athletes to defray actual expenses." The National Collegiate Athletic Association has said repeatedly that preserving the spirit of amateurism—not compensating players for use of their likenesses—is consistent with federal antitrust laws. But the association’s general counsel, Donald Remy, disagrees with the plaintiffs’ characterization of the waiver. "It doesn’t give us any right to commercialize," he says. And "it doesn’t extend beyond the student-athlete’s eligibility." Remy adds that "when you’re talking about licensing footage, the copyright belongs to whoever made the footage." A class certification hearing was set for June. The NCAA failed to convince a judge to throw out the suit on procedural grounds in January. The trial date is set for July 2014. The NCAA has been accused many times of operating as a cartel, and it has lost several landmark cases. In one class action, White v. NCAA, the association agreed in 2008 in U.S. District Court in Los Angeles to create a $10 million fund for student-athletes to reimburse costs that their scholarships did not cover. The plaintiffs argued that limiting student-athlete grants-in-aid for tuition, room and board, and books in certain sports amounted to a restriction of trade. And in Law v. NCAA, a 1999 settlement left the group on the hook for more than $54 million in back pay to assistant coaches, who claimed the NCAA put a restrictive earnings cap on their salaries. But a 1984 decision by the U.S. Supreme Court was the first major antitrust suit against the NCAA. In NCAA v. Board of Regents of the University of Oklahoma, which focused on control of television rights, the court ruled that the organization violated the Sherman Antitrust Act through its control of television rights to college football games. The court established that the NCAA comprises a coalition of competitors and can be held responsible for restraining trade. "In any other industry, allowing all 345 employers [the Division 1 institutions of the NCAA] to form a nationwide wage cartel, while generating nearly 45 percent profit margins, would be an instant target for a Department of Justice or Federal Trade Commission investigation and private litigation," according to Andy Schwarz, a sports economist and partner at OSKR in Emeryville, Calif. Schwarz is a consultant for the plaintiffs in the O’Bannon case. However, the NCAA has a track record in fighting off antitrust lawsuits from athletes, says Rick Karcher, a sports law professor at the Florida Coastal School of Law. In some cases, the courts have agreed that the amateur status of college sports means that its activities are noncommercial. Karcher calls the antitrust approach in the O’Bannon case "creative," noting that receiving treble damages is attractive. "In my view, the most viable theories are unjust enrichment in the context of live game broadcast revenue and a publicity rights violation," Karcher says. Student-athletes have long argued that the lack of compensation is unethical. The National College Players Association is an advocacy group founded by Ramogi Huma, a former UCLA linebacker, to advocate for the rights of student-athletes, including fair compensation, minimizing the risk of brain injury, coverage for sports-related medical expenses and other protections. Huma says the debate should not be about whether to pay student-athletes, but how. He supports a "lockbox trust" for funds the student-athlete would gain when his or her college career is finished, provided the player consistently adhered to NCAA rules and received a diploma. Huma also says student-athletes should be allowed to add to that trust with proceeds from autographs and endorsements, like the Olympic amateur model allows. Although the NCAA is a nonprofit entity organized under Section 501(c)(3) of the tax code, critics say that its main priority is making money. "The NCAA is doing nothing more than operating like a for-profit business," Karcher says. National Collegiate Athletic Association executives make six-figure salaries, and the NCAA sells rights to televise games for hundreds of millions of dollars each year—more than $690 million in the 2011 fiscal year, according to its most recent tax filing. It ended the year with a $40 million surplus. Colleges have received more than $1 billion in royalties since 1981 from licensing their logos and students’ likenesses and names to the Collegiate Licensing Co., also a defendant in the lawsuit. And Collegiate Licensing itself makes 80 percent of the $4.6 billion college sports retail market, according to its website. In response to those claims, Remy contends that "a very, very small group of athletic programs in our member institutions actually operate ... in the black." As college athletes more and more see the courts as their only means of recourse—they cannot be unionized, thanks to their amateur status—Karcher says it boils down to current and former athletes pondering one basic question: "Why should athletic department administrators, coaches, conference commissioners and commercial sellers of products have the right to exponentially enrich themselves at our expense?"